Hopes are raised as Ukraine pays 786m dollars towards its $3.5bn debt with Gazprom. According to EU Energy Commissioner, Guenther Oettinger, Ukraine and Russia had talks and agreed on a partial payment. According to Mr. Oettinger, Russia’s energy minister Alexander Novak agreed to lift the demand made this week for immediate payment of at least $2 billion. Yuri Prodan, Ukraine’s energy minister, along with officials from Ukraine’s gas company Naftogaz, said they were keen on trying on Monday for an overall deal. Russian negotiators say talks will continue as soon as the money arrives in Gazprom’s account, supposedly on Monday. Russian gas giant Gazprom had given Ukraine until June 2nd to settle its debt, threatening to cut natural gas supplies if it did not pay up. According to Gazprom’s CEO, Alexey Miller, Ukraine had built up such high outstanding debts that his company was left with no other choice. Mr. Miller said Ukraine had to pay for any deliveries made in June in advance. He added that after receiving bailout money from the IMF, Ukraine was in a position to settle its debts. Ukraine owes Gazprom 9.42 billion cubic meters’ worth of Russian natural gas, he added, about as much as Poland buys in a year. Ukraine complained that Gazprom had arbitrarily doubled its price of natural gas. As soon as Gazprom lowered its price, Kiev said it was willing to consider settling its debt, Finance Minister Oleksandr Shlapak said earlier this month. At $485.50 per 1,000 cubic meters, Ukraine has to pay a much higher price than its European neighbors do. It used to pay just $268. Mr. Shlapak added that his country is prepared to issue bonds to raise money to cover its natural gas arrears. Now that Ukraine is backed by the IMF and European institutions, Ukraine has enough credit to do so, Mr. Oettinger added. Whether Gazprom will agree to a return to the old price remains to be seen. The Russians made no comment, saying they need to wait for the money to arrive before they decide on their next move. The New York Times quotes a Gazprom executive (who wished to remain anonymous) who mentioned there had been previous instances of Ukraine saying it sent money which never arrived. Europe is keen for Russia and Ukraine to resolve their stand off. About 15% of Europe’s natural gas supplies come from Russia via Ukraine. There is concern that if Ukraine’s supply is cut off, it may be tempted to take some that goes through its pipeline for its own consumption. This occurred in 2006 and 2009. A dead pipeline in Slovakia is in the process of being repaired so that natural gas from Central Europe can be sent to Ukraine in the event of a shortage. Experts said the arrangement would not infringe any deals made with Gazprom regarding reversing natural gas flows. 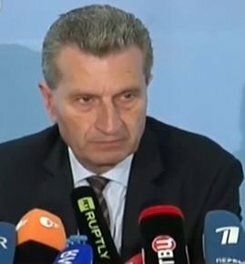 Mr. Oettinger, the EU Energy Minister, seemed puzzled as to why the payment had to go through a US bank. Josef Braml, a foreign affairs expert who works at the German Society for Foreign Policy, recently wrote an article published in ifo Schnelldienst expressing concern about the Ukraine-Gazprom dispute. Foreign policy refers to how a government deals with other countries. Braml hopes that European nations will use this crisis to reduce their dependency on energy imports. Russia, also in a quest to reduce its reliance on Europe for its energy exports, recently signed a 30-year deal with China worth $400 billion, i.e. $13.3 billion per year. Not details on prices were given. The two nations announced that, starting in 2018, Russia will start delivering about 38 billion cubic meters of natural gas each year to China. However, analysts say that China is likely to have negotiated a very low price, given Russia’s political and economic isolation.